League Two side Wrexham have sacked manager Denis Smith and his assistant Kevin Russell. The club said in a statement on their website: "Nobody has wanted Denis and Kevin to succeed more than the Directors of the club. "However, we feel we have no option at this time but to make a change to allow us time to turn things around." Brian Carey has been installed to take over first-team duties as Wrexham aim to pull clear of the relegation zone. The statement went on to say: "This is a club that is making good progress off the field. We are extremely ambitious and want and need to be in a position to challenge in the league. "We hope that a dawn of a new era will bring just that." 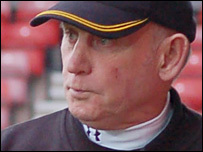 Former York, Sunderland and Bristol City manager Smith succeeded Brian Flynn as manager in 2001. Wrexham striker Lee McEvilly has questioned the decision to dispense with Smith's services. McEvilly scored the final goal of Smith's long reign during last weekend's FA Cup third-round defeat at Derby. He said: "I've only been here for 18 months but I think it's harsh - they could have waited until the end of the season and see where we ended up. "The transfer window is open now. They could have given the man a bit of money and see what he could have done."